This is the second of three blogs I’ve shortlisted to share with you from many more Year 2 and 3 Textile Design Degree students at Falmouth University. I had the pleasure to hear each student present their project and then have a one to one tutorial, asking them more questions about their project, objectives and strategy as well as offering them advice on how to improve their craftivism project to have more impact before the final deadline. Here is one of the three strongest final projects presented, created by Lizzie Porter, a second year Textiles Design student. 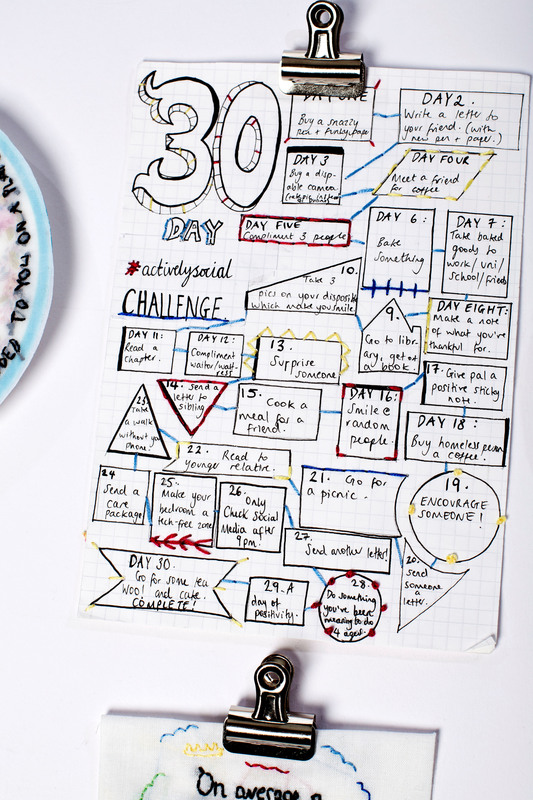 I hope these three blogposts encourage you in your craftivism, show you how people have thought through their strategies, who they are targeting as an audience, their clear and realistic objectives and how to execute them through their craft. 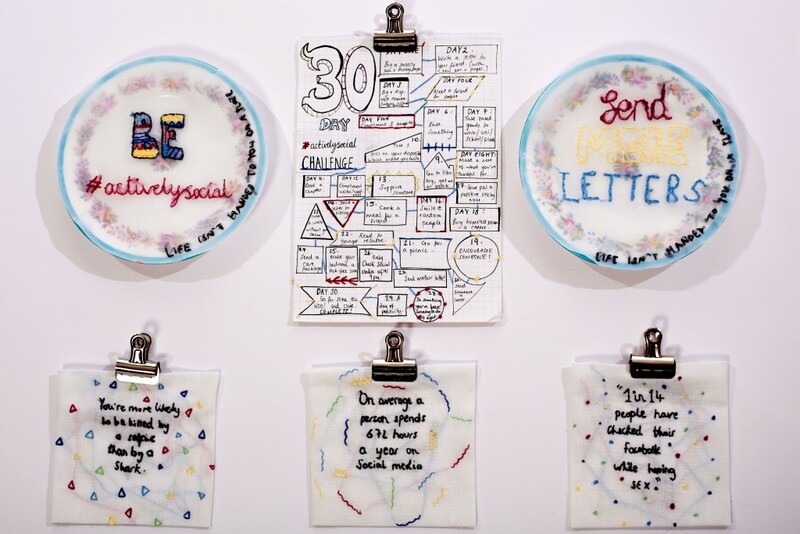 These blogs also remind us all of the variety of craftivism projects that can be created and have a positive impact. Lizzie, how did you get into Craftivism? As a Textiles Design student, I am very much into the craft side of life, so when we were given a brief to create a project about something that we feel passionate about through the art of stitch, I knew Craftivism and I would be fairly good acquaintances. Knowing nothing about Craftivism at the start of the project, I watched Sarah’s videos online and immediately understood the ethos behind this line of thought, completely agreeing with Sarah’s point of view. “Social Media Has Consumed Our Lives”. Photographer: Shannon Darby-Jones. The concept of ‘Social Media is consuming our lives’ was created by the realisation that social media is bordering on an addiction for our generation. The audience for this collection is 18-30 year olds who have very little interest in Activism as they have little knowledge of the concept. 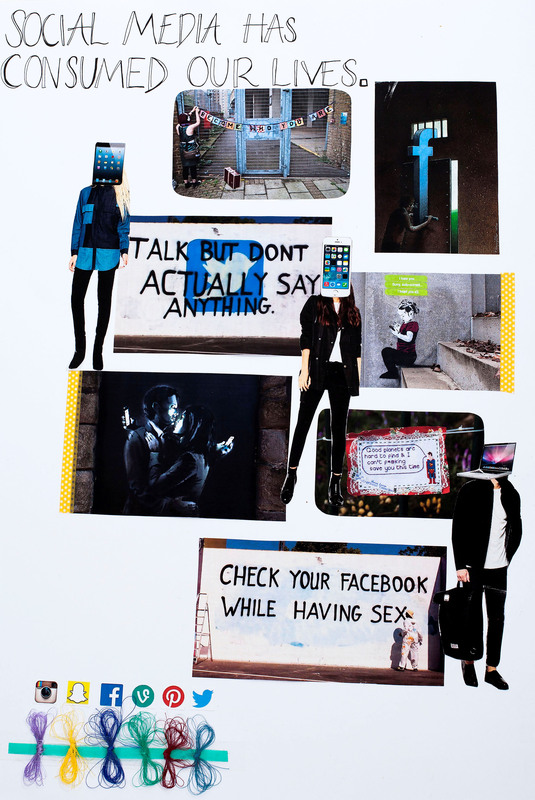 My overall aim of ‘Social Media is Consuming Our Lives’ is to open my audiences eyes to the extent we use Social Media and to introduce the ’30 Day Actively Social Challenge’ to take action and to help our generation stop staring, posting our lives and being constantly enticed to an electronic rectangle that lights up. I am also aiming to bring back old school activities such as sending letters rather than just sending a quick Facebook message. The way the reader can see the senders hand writing in a letter means a lot more than the same standard Arial font on a mobile screen. The main reason I’m trying to bring back activities such as sending letters, is because at Uni my mum sends me letters, but my housemates can’t get their head around why we do this, when we both have WhatsApp and this message could be sent to one another in a matter of seconds. This then moved me onto the thought that we want everything instantly nowadays and ‘handed to us on a plate’ which is where my idea of embroidering onto plates came from- to symbolise we must take action towards change, it doesn’t just happen instantly. I would like Craftivist followers to respond in a positive way whereby they think ‘I’m going to put my phone at the bottom of my bag while I have coffee with my friend’ or ‘actually no I’m not going to send a Facebook message to my sister asking how she is, I will write her letter.’ But more than this I would love my work to catch the eye of just one person who knew nothing about Craftivism and that although they may not change any of their present habits – it might plant the tiniest seed of interest. I thought a lot about the world before Social Media, such as my parents’ generation at my age without it and both the advantages and disadvantages of this. I had many thoughts about the psychological impact behind the reason we upload these things on social media. We do it for the ‘likes’ and why it is that these ‘likes’ make us feel quite so good inside, when it is only someone the other side of their phone pressing their fingertip down onto the screen. Another thought that kept going through my head is why time goes so fast when you’re stitching!? 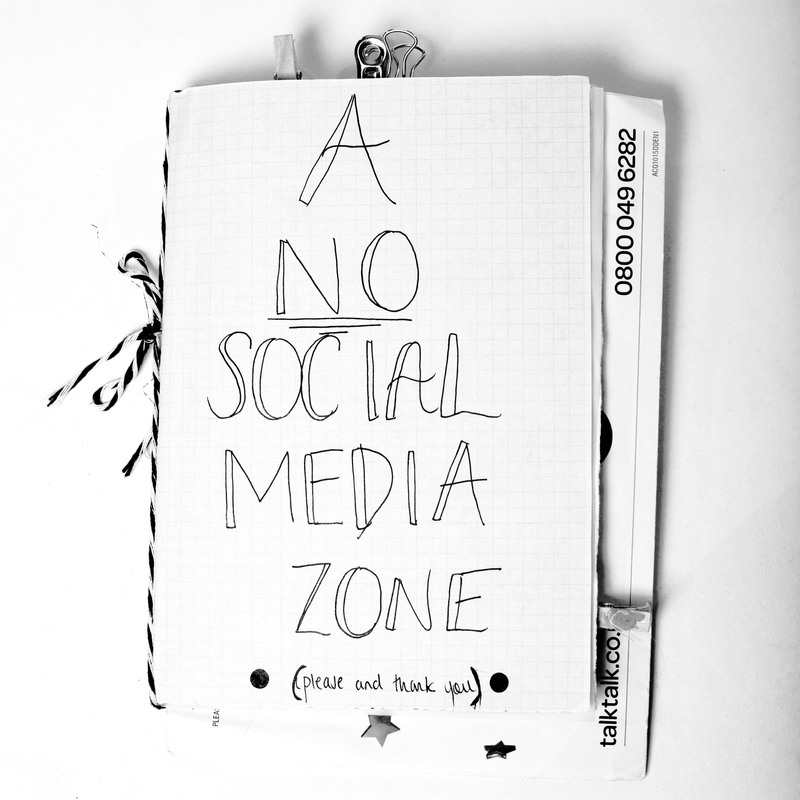 “A No Social Media Zone”. Photographer: Shannon Darby-Jones. For me, Craftivism isn’t a stampede of buffalos charging through the environment making great trails of change behind them, but more like pollen- no one really notices it, but it is there quietly landing, unnoticed, until one day, a poppy as red as your imagination will appear and then be gone the next, but you will never forget having seen that poppy and how you felt when you saw it. The reason I believe this, is not because I am against protesters, I have respect for them for waking up, seeing we need change and putting themselves out there to put their opinions across. However, I have two lines of thought on trying to makes changes in this way, firstly we are not all made with loud voices and full of confidence. So I believe Craftivism is for us quieter creatures, who know we need change in this world however feel a little alienated by the fact to put our opinions across we must first grow a big voice. I was always taught ‘actions speak louder than words’ and Craftivism is a perfect example of this. We can sit comfortably in our own company or in a group of similar strong believers stitching this piece of craft that holds a message we feel passionately about through the simple art of a needle and thread. Secondly on finding this piece of work, the individual has no idea who made it – Student? Jew? OAP? Immigrant? Therefore does not have that automatic ‘off’ button triggered in their head the way that popular Media can activate. You only have to watch programmes such as Gogglebox to see that an awful lot of people have preconceived ideas when it comes to protest and who to follow. Students will evoke a feeling of ‘Bloody lazy, they should be out there working’. OAP’s are more likely to get ‘They have no idea what is going on in the real world they’re past it’ and we could all write pages on the prejudices that people have when it comes to Religion, Colour and ethnic background! 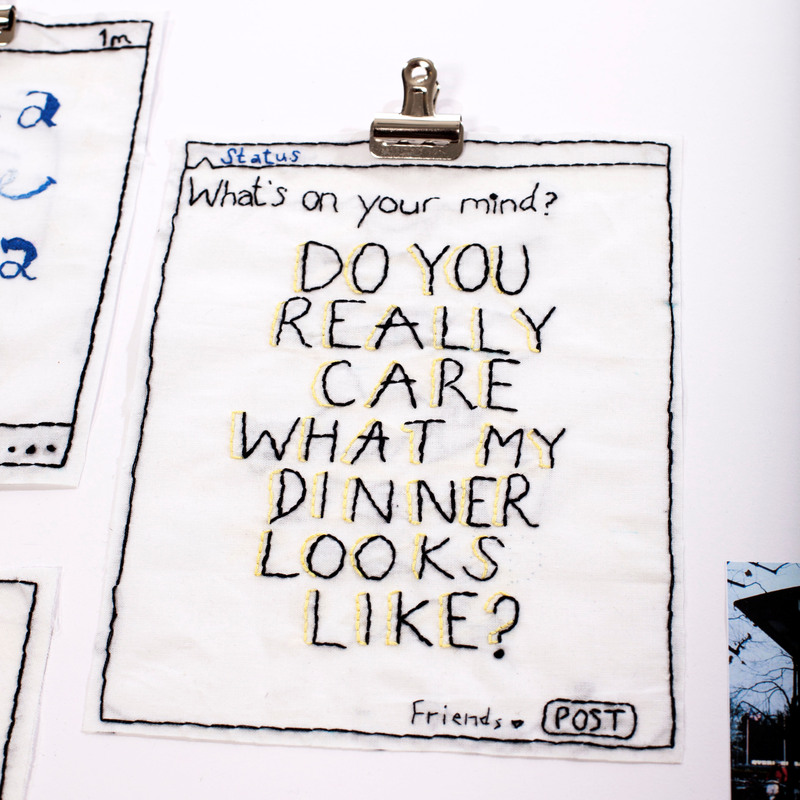 As a result Craftivism is helping to change the world as it is aesthetically pleasing for the eye, therefore our attention is brought to the piece, leading to the fact we are far more likely to acknowledge the message and therefore act upon it. It is helping us to all become aware of the problems around us in a far gentler, inviting way so we can all join together and be motived to take action. I do not want to get the response that I am trying to get people to stop using social media all together, as that is unrealistic in this modern way of living and would mean I’d have to stop my romance with Instagram too. My aim is for us to just become more aware of how much time we should spend using it and to become aware of the types of situations we should or shouldn’t be on it i.e. seeing a couple on their first date at a lovely restaurant both staring at their phones, makes me sad. I want people to look up from their phones and look around them, pay attention to the people they are lucky enough to have in their lives, make the most of every minute they have in a new experience and most of all look at the little things in life, that if we were staring at our phones we may miss that poppy. 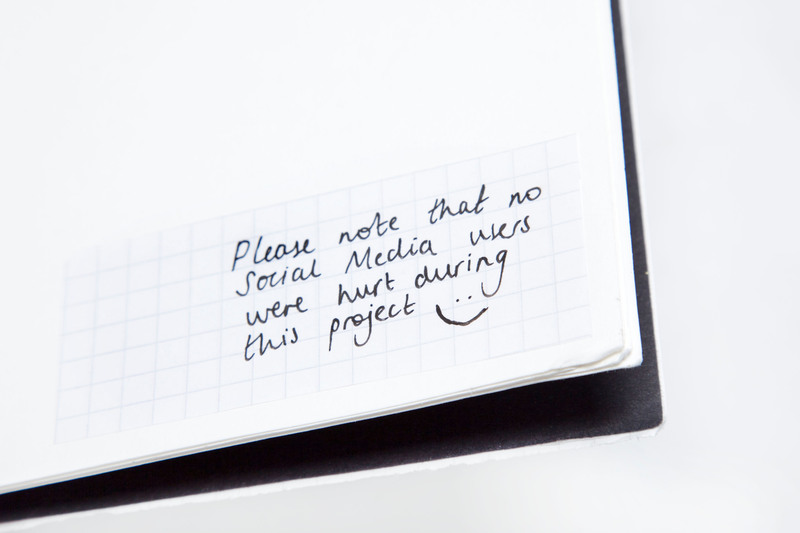 Please Note That No Social Media Were Hurt During This Project. Photographer: Shannon Darby-Jones. Lizzie is a 2nd year Textiles Design student at Falmouth University, who can’t resist cheesy wotsits. Follow her on Instagram: here. Bravo! I love it – and you are right, I try to limit my time on social media because it takes away from my time making art, that said – send me your address I will send you a letter.